Dwarf Spade is a private investigator in Mage City. He is not ambitious, all he needs are a few easy jobs to buy booze and pay for his living. A beautiful elven woman offers him a job that sounds easy enough, and although her brother tries to scare Spade, he accepts the job. Soon he finds himself in one dire and dangerous situation after the other, and without his partner Crizz, and his friend Liz, he’d be helpless. Suddenly, they have to save the world from total annihilation. This book is very difficult to rate. I’d give it 3.5 stars, but since that isn’t possible, I mark it four. When I volunteered to listen to the book for review, I didn’t know what to expect, but the synopsis made me curious. However, the book failed to draw me in from the start. I can’t say why, though. To me, all the references to The Maltese Falcon felt just a tad too forced. I don’t mind a genre mix, and the idea of a detective story set in a fantasy world appealed to me, but it didn’t work for me. I found it entertaining in parts, but in other parts my mind drifted, the story couldn’t really keep my attention, and often enough, I had to wind back to listen again, only to find that I hadn’t actually missed anything. I didn’t root for any of the characters, though I liked Liz and Crizz, Spade’s sidekicks. What I liked, was the idea of the various races overcoming their animosities and prejudices and working together, even starting to like each other. Jack Wayne did a fine job with the narration, which is no mean feat, because there’s quite a range of characters. The sound quality was excellent. I was voluntarily provided this free review copy audiobook by the author, narrator, or publisher. As always, this did not affect my review. Keeva is looking forward to being imprinted with her intended life partner — however, she’s sorted out as an anomaly, because said partner is no more. She and six other anomalies undergo a variety of tests, and all seems to turn out well after all. But then she suddenly finds that her life as it was has ended. She is in danger, and now she must find out why, and she must find help. But who to trust? This is certainly a series to watch out for. I don’t think there’s a sequel yet, but I hope there’ll be. This drew me in right from the start, and it kept me glued to my earphones until the end. Yes, it is a YA dystopie, so I’m not among the target group, but then I love YA novels, and this book is no exception. The idea itself isn’t novel, I was reminded of other well-known novels with the same topic, but that doesn’t mean the story is old. On the contrary, it is a very refreshing tale of what happens if you don’t fit the norm. Keeva needs to find out who she is, what she is supposed to do, what is truth and what are lies, who is friend and who is foe. It’s a coming of age story, and so much more. There are very many twists and turns, and some of the truths Keeva discovers are completely unexpected. Lucinda Clare did a fabulous job at narrating the story, bringing all the characters to life, as well as the world. It was like watching a film (I can absolutely imagine this on the screen). The authors as well as the narrator were new to me, but I’ll watch out for other books by them, and I really hope I won’t have to wait for the sequel very long. Apparently, June Is Audio Book Month, and so I was challenged yesterday. I like challenges, and maybe so do you, so I thought I’d spread the word. Check out either website for more information. Tina’s explained it well here. This challenge runs for all of June 2017, so if you start today, you have 30 days. I’m now off to check out which of my audio books suit the challenge. 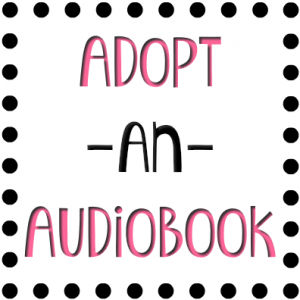 If you’re interested, you may find some suggestions for great audio books on my blog. A good one will be posted tomorrow, so watch this space. That’s it. I listened to more books, but none that fit the above mentioned criteria. I’m currently listening to Christina Ricci’s rendition of ‘Little Women’, which would fit the ‘narrated by a famous actor’, but I won’t finish it this month. I’m job-hunting, so my listening time is somewhat reduced.